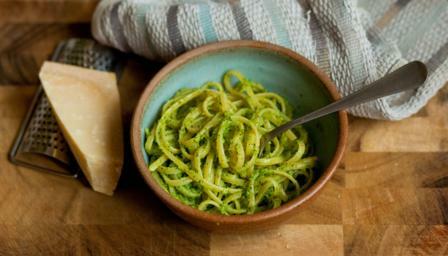 Boost your five-a-day by swapping pine nuts for broccoli in this tangy pesto pasta. It’s ideal as a quick midweek supper that even the kids will eat. Equipment and preparation: You will need a food processor for this recipe. Cook the spaghetti in a large saucepan of boiling salted water according to the packet instructions. Meanwhile, steam the broccoli over a pan of boiling water for 6 minutes, until it starts to soften but is still a vivid green. Place the broccoli in a food processor bowl, add the basil, Parmesan, garlic, olive oil and lemon juice and pulse until just blended. Taste and season with salt and freshly ground black pepper. Drain the pasta and return to the pan, then add the pesto and stir through to combine. Serve with some extra Parmesan grated over the top.